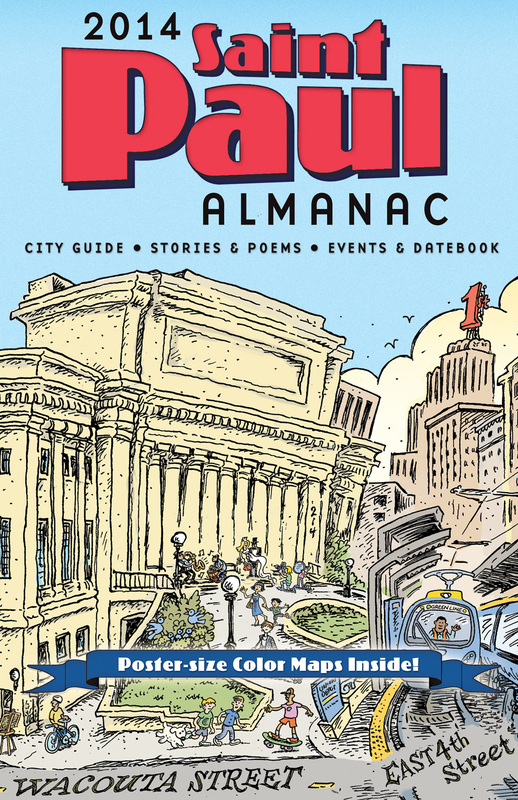 Cover of the 2014 Saint Paul Almanac. Illustration by Ken Avidor, Cover design by Nigel Parry. Be among the first to own the eighth edition of the award-winning Saint Paul Almanac on Thursday, September 12th, 2013! is dedicated to the memory of Bertha Givins, a Saint Paul writer and beloved Rondo neighborhood storyteller. features stories and poems from more than 100 local writers, including Joyce Sutphen, Heid Erdrich, Yusef Mgeni, Carol Connolly, Harriet Bishop, Emmanuel Ortiz, Garrison Keillor, IBé Kaba, Margot Galt, Connie Wanek, and many more! includes over 250 beautiful, full-color photographs and illustrations by local artists in an updated, contemporary design by Judy Gilats that features a user-friendly datebook, enhanced city listings, and full-page images! proudly presents larger prints of its hand-drawn maps of the city of Saint Paul and Downtown by illustrator Roberta Avidor—now 50 percent bigger than previous editions! 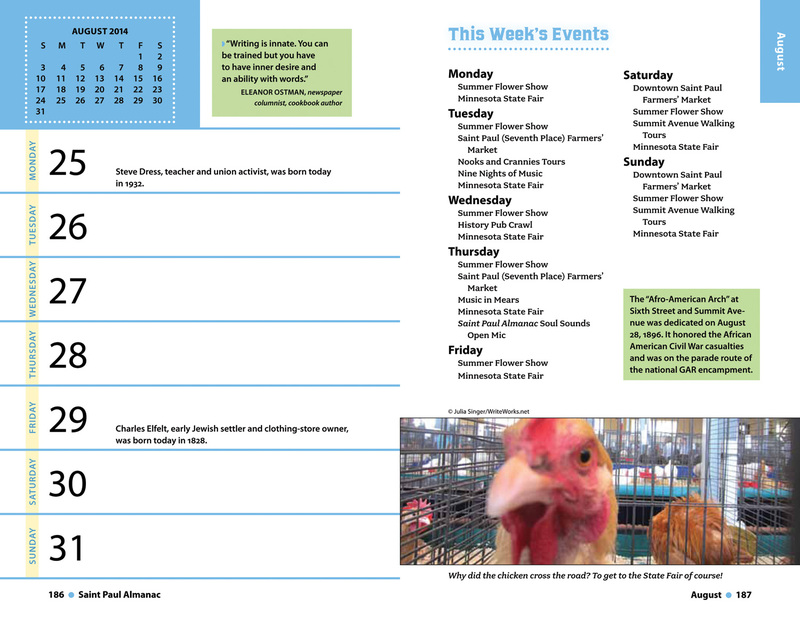 Sample datebook page spread from the 2014 Saint Paul Almanac. 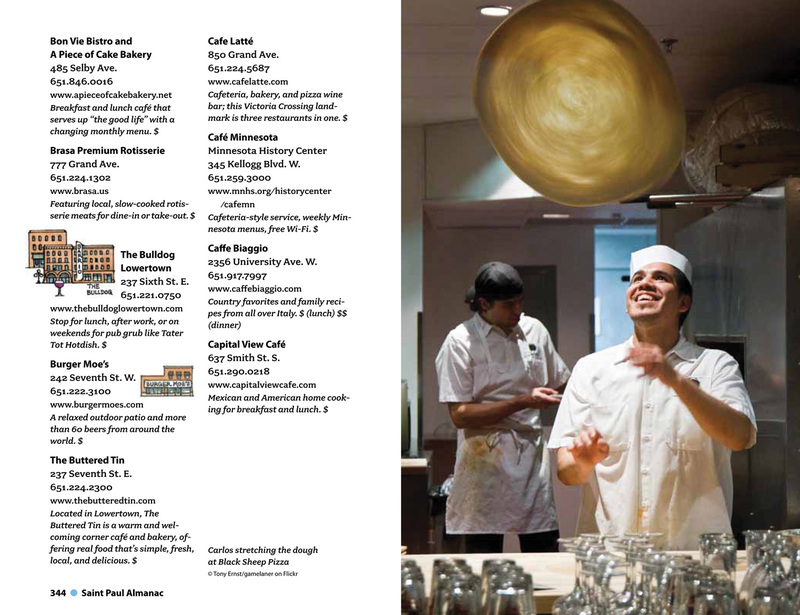 Sample listings page spread from the 2014 Saint Paul Almanac. The 2014 Saint Paul Almanac launch party will take place in Lowertown, Saint Paul, at the AZ Gallery, Black Dog Coffee & Wine Bar, and Clouds in Water Zen Center, at 308 Prince Street, Saint Paul, MN 55101. Cheap parking available in the Kellogg Boulevard and Prince Street lots. This event is free and open to all. Donations are gratefully accepted. 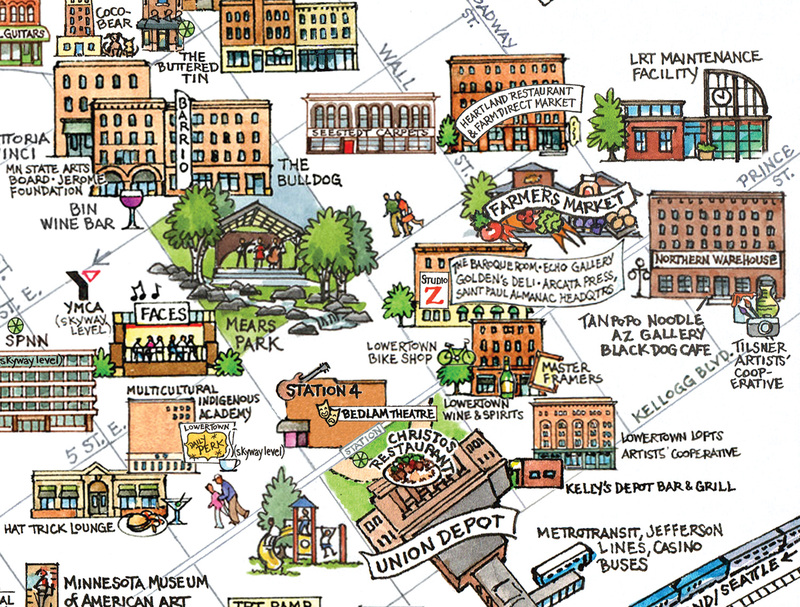 Lowertown detail of Roberta Avidor’s hand-drawn map of Downtown Saint Paul, one of two maps that come with each copy of the Almanac. The maps have been greatly updated since the 2013 edition. Author Readings — Join us in the Clouds in Water Zen Center to hear authors read their stories and poems from the 2014 Saint Paul Almanac, including Saint Paul Poet Laureate Carol Connolly, Patricia Young, Nimo Farah, Donte Collins, and IBé Kaba. Art Exhibit — The opening night of a month-long exhibit (through September 29th) of paintings, photos, sculptures, and other original art commissioned for the 2014 Almanac, in the AZ Gallery and Black Dog Coffee & Wine Bar. AZ Gallery Hours: Thursdays & Fridays, 5 p.m.–8 p.m. and Saturdays & Sundays, 9 a.m.–3 p.m.
Live Music — Black Dog Coffee & Wine Bar: At 7 p.m., traditional Irish music by Mattie Ernst, Chad McAnally, and Todd Menton. At 8:30 p.m., the duo Hot Date (facebook.com/WeareHotdate) will convince you that Saint Paul—not Paris—is the true city of love. Yet More Live Music! 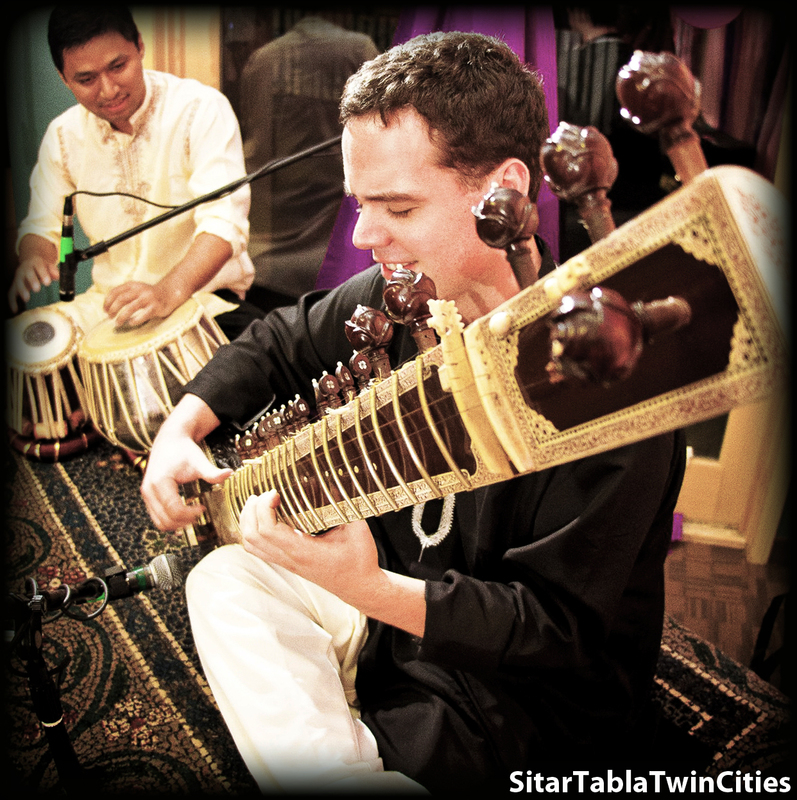 – Throughout the night, SitarTabla Twin Cities (facebook.com/SitarTabla) will create an Indian instrumental soundscape in the AZ Gallery. 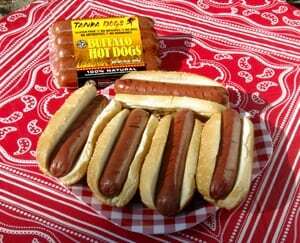 Buffalo Hot Dogs, like the Almanac, are good for the heart. Food & Refreshments — Available at the Black Dog Coffee & Wine Bar, including buffalo hot dogs and chips for just $6. The Black Dog has an extensive wine list and eight local and regional craft beers on tap. Our Book of Days Fundraiser — It’s back! Know someone who loves Saint Paul? Someone who can’t get enough of arts and literature? Someone who celebrates all things local? Invest in next year’s Almanac by buying a day, a week, or a month to highlight, celebrate, and commemorate a friend or other loved one’s birthday, wedding, anniversary, graduation, or other life-changing event. More information. Publicity Contact: Nigel Parry, 646-812-0897, nigel@saintpaulalmanac.org. Media Images: Please contact for access to a one-click download, zip file of artwork, including the book cover, sample page spreads, and other artwork & photos from the 2014 Almanac.